We have just returned from this fabulous hotel,there was a group of 12 of us ages rangeing from 16yrs to 53yrs and there was plenty to do for everyone. The food was excellent good variety and the staff were very friendly and courteous. The rooms were very clean and the surrounding gardens and views were lovely. When we arrived the rooms had fresh fruit baskets, a bottle and wine and water all complimentary. We will certainly be returning to this hotel. We cannot fault this hotel at all.....everything about it is fantastic! 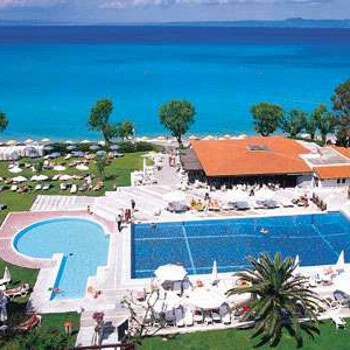 Extremely clean, beautiful grounds and gardens, great pool area, plenty of free sunbeds, staff are so helpful and friendly and the food is out of this world....we only ate out 1 night because the food in the hotel was so good! We stayed there for 2 weeks and they didn't repeat a meal once the whole time we were there. We had 3 themed nights in the restaurant while we were there....Italian, Greek and Chinese - the food really was amazing...plenty to choose from. If you can't find anything you like then you must be extremely fussy! Also plenty to choose from for breakfast....cereals, breads, cakes, fruit, salads, pastries, traditional english fry up, boiled eggs, etc. Rooms are nice and comfortable, plenty of space for the two of us, with lovely side view of the calm sea from the balcony. Rooms cleaned every day by the friendly maids. Blue beach towels are provided for use round the pool and the private area of the beach - the lifeguards prefer you to use these towels so they know you are guests at the hotel (this stops people using the free hotel sunbeds if they aren't guests there). Great hotel entertainment team in the day (Renee, Kristoff + Simone) organise sports/games if anyone wants to join in (darts, table tennis, water polo, volleyball, aerobics, etc). Really lovely people. Hotel is situated in a fantastic spot - right on the beach in a peaceful area within 5 mins walk of the main square. The only bad thing to say about the hotel is the evening entertainment wasn't that good, but we preferred to go and sit in a bar on the square and watch people walk by anyway, so that didn't bother us! Overall 10 out of 10......we will definitely be going back! Excellent hotel. Staff very friendly service prompt but nothing pushy. Superb location 300m or so to main resort but supermarket and bar just across the road. Hotel grounds back onto the beach. alarm for 6.00am to join the sunbed scrum. Best air con I have ever known. Stayed on when patio door open and room key card out. but it was needed temps were 40 degrees even staff were too hot. Food superb feel my waistband tightening. Free wine fruit and water on arrival nice touch. Animation staff very enthusiastic have to mention Leonoras aqua aerobics. If I really wanted to be picky what could i find to critisise? Well entertainment was not so good but it never seems to be in greece. Could have done with more pillows in room. Could have been more variety of English breakfast no proper sausage or mushrooms or show cooking of omlettes. This hotel is absolutely perfect! Spotlessly clean, food excellent, varied and plentiful. Rooms cleaned daily + free air con (very welcome when temperatures hit 42 degrees at one point!) Free towels, sunloungers & parasols on beach and pool which saved us a fortune. Perfect location, pool & gardens just a couple of steps from beach (quite pebbly but clean) Staff extremely friendly and helpful, especially Timos our waiter who was extremely patient while we practised our greek on him! My daughter celebrated her 10th birthday while on holiday and the hotel even provided a cake and candles for her! She made some great friends and we hardly saw her all fortnight, as Oliver and his team kept all the kids entertained at all times. Entertainment team worked their socks off - evening entertainment slightly cheesy but great fun! Can't recommend this hotel enough we are definitely booking for next year. Never stayed in a hotel with such friendly staff from the guys keeping the grounds immaculately clean & tidy through to the reception & management staff, with a special mention to Timos, our waiter who was brilliant. Food choice & quality excellent. Plenty of room to sunbathe in gardens, around pool or on beach with no shortage of sunbeds so no need to be up early to reserve them. This is a return trip for us having last stayed 4 years ago. The quality of staff to attention and detail is second to none, standards have remained high. Food is variable and plentiful based on a self selection buffet, theme nights are intresting to try dishes from other parts of the world. Entertainment is acceptable for watching or getting involved if you so wish. Rooms are very comfortable maid attends every day towel change every other day. Air conditioning was a godsend as temp was 30+, fridge, deposit box even free toiletries. The pool and garden grounds are impeccably clean, and bonus of private beach with sun beds, brolley and towels all free of charge. We will return next year, you will not be disappointed.